It’s that time of year again . . . hot dogs, Cracker Jack, and baseball. And when it comes to baseball, we’re at the most exciting part of the season, the playoffs and ultimately the World Series. In the spirit of the sport, this movie couldn’t have come out at a more appropriate time. If you are a fan of baseball or of sports in general, chances are you will like this movie. It is a simple production of a simple movie about simple people in a simple town. 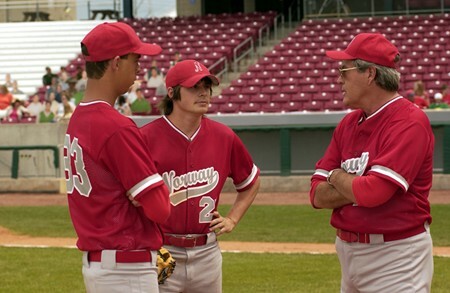 The complexity and potency of this film comes from the true story it is based on and the passion for baseball. The passion is evident through the Norway High School baseball team. Baseball for this team and for the people of Norway, Iowa (population 586) is more than tradition, it is their lives. In the midst of all the heavy drama and strong action movies that are out now, this is a decent feel-good movie that is a nice change of pace. What makes it special is how the kids of this high school face incredible odds and still manage to win the State Championship not once or twice, but 19 times in 23 years. The tale of this team takes us to the end of its 19th championship season and the tribulations that arise as they seek their 20th. The State of Iowa, in trying to cut costs, is consolidating smaller schools into larger ones. This decision eliminates Norway High and dismantles the dynasty baseball team which is completely devastating to the team and the people of Norway. Compare it to if the Yankees were moved out of New York. The school has one year left of operation and thus the infamous baseball team has one “Final Season”. To make matters worse, the legendary coach of this team for the majority of its championships, Coach Jim Van Scoyoc (Powers Boothe) is fired in an attempt to ease the dismantling process via a losing season. A former assistant coach, Kent Stock (Sean Astin) is hired as a joke to coach the team for this last season in order to facilitate the failure. The real challenge begins as Kent tries to win over his team and inspire them to fight for one more championship so they can go out as winners in the midst of this tragedy. Baseball players are grown in the small town of Norway. The skills and fundamentals are passed down from generation to generation and they culminate into the Norway High School baseball team. The actors in this movie form a pretty good team as well. No performance stands out too far from the rest but as a collective they did a great job in telling this incredible story. Honorable mention goes to Powers Boothe whose presence on the screen is power-ful (sorry, I couldn’t hold that one back). His stern face and strong voice demand undivided attention. The landscapes of fields and farmlands of this Midwestern town will humble you. The shots on the baseball diamonds will make you want to grab a bat and play ball. There are some similarities between this movie and the Bad News Bears, but even though the story line is typical and predictable, the fact that it is based on real events will make you cheer. Being from Iowa myself, and having a brother that played on an Iowa varsity high school baseball team, I can tell you that this story kind of hits home for me. The movie goes to show the values that Iowa not only places on baseball but on all high school athletics as well. It is hard to imagine the tradition that the Norway baseball team would still have today if the school had not merged. Norway's high school and baseball tradition are now lost, but the values of Iowa and its athletics will always live on. This is a fantastic movie told in a special way. Not only does it have a great story, it has incredible baseball action. If you like baseball, you will love this movie. If you don't like baseball you will still love this movie. "The Final Season" is the best feel-good movie I've seen in years -- a welcome change of pace from the steady run of violent finms we've seen lately. Great for the kids and the kids in adults. See it! Not a bad movie. Some of it just has to be dramatic license: a high school pitcher with a 95 mph fastball? I doubt it. And a pitch that almost hits the batter's head is a strike? I doubt that, too. And a player in danger of being ejected for yelling at his teammates? I don't believe that either. If this movie is for kids, why use the bulls**t? Or pi**ing off the baseball gods? Four-letter words are NOT for kids, just for foul-mouthed adults. I liked this movie because the actors looked and played like ballplayers. One of the biggest complaints I have about Sport movies is that the characters look and play like actors not atheletes. These guys looked the part...the situation is of course embellished by Hollywood but the story is beleiveable. I loved the way the kids started to believe in themselves and I liked the way Sean Astin handled them...it's a better than most baseball movie and should be seen! If you like baseball, and better yet played baseball at this level you will love the movie...Good job guys!